Just got hold of a Krytac CRB, thought I'd throw up a quick initial impression by way of pros and cons. Hope this is useful for anyone considering buying one. Overall I'm pretty pleased with the CRB. It's light weight, well built and has a top notch gearbox. My only gripes at this stage are with the flash hider (promptly removed via a hair dryer and a bit of persuasion and replaced with a stubby suppressor), the grip (promptly replaced by a MOE) and the motor. I don't know if they ship with a different motor in the UK as I heard good things about the stock ones, but it very weak with sluggish response (compared to my other AEGs) and tons of overspin and a tendency to heat up quickly. Very disappointing. Luckily I had a spare SHS high torque laying around which has sorted things. Anyone thinking of buying a Krytac should factor in the cost of a decent motor. I'll throw in an updated review after skirmishing the CRB a few times. Think you might need to take it back. The krytac motor is probably the best ferrite motor I have seen in an aeg. Your one sounds faulty. I don't think its faulty, it just doesn't hold a candle to a decent Neo motor. What's disappointing is that every review I've seen the Krytacs have their "30k torque" motor, which, by all accounts is a decent Neo motor. I thought it was as good as an Shs but not as good as say a lonex. Still think it sounds like an issue. Got to agree with the grip its horrible. Actually I was wrong it is neo apparently I thought it was ferrite my bad. All the krytacs are basically the same its just different external furniture. love my Krytac Trident PDW! Skirmished my new Krytac today, my motor was fine unless I pumped multiple semi shots in a row, in which case it got quite warm. But that was more my fault for not using the full auto. Paired with some Lonex flash mags it did some damage today haha. Skirmished my new Krytac today, my motor was fine unless I pumped multiple semi shots in a row, in which case it got quite warm. My point exactly, this shouldn't really happen on an AEG without an active breaking mosfet. As for the sluggish response, I have reiterate that because I have high torque motors in all my AEGs it's a relative thing but noticeable none the less and especially disappointing given they ship these with a high torque neo motor in the US and other places. TBH I think that the justification I've read that because the springs for the UK model arent as strong they dont need a HT motor is balls. Smacks of a cost cutting exercise. 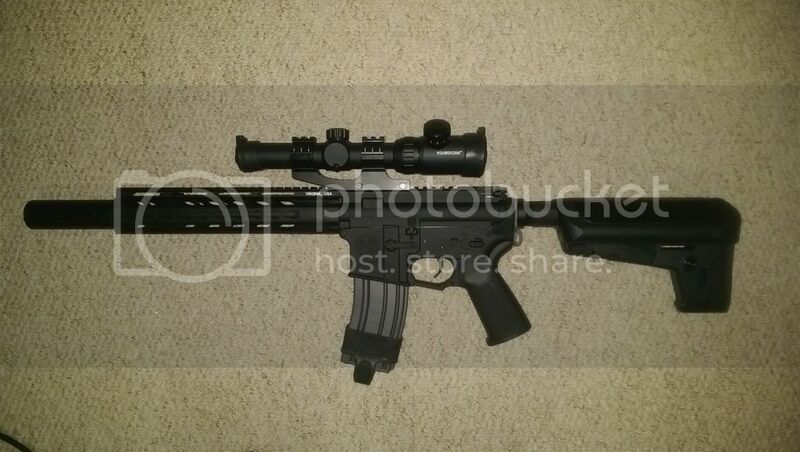 In any case, its a solid AEG with many positives and I would say that its probably the only AEG I've bought that I wont have to change or modify the gearbox on. - It performed very well, the hop unit/rubber in particular impressed with good range and consistent groupings. - The SHS HT motor produced a high ROF on auto with an 11.1 lipo (expected - I've used this combination before) with no feeding issues. Although after a couple of hundred rounds it did start to double fire due to overspin (perhaps they were right to ship it with a weaker stock motor). This will be cured with the addition of a Jefftron programmable mosfet, just ordered off the back of a recommendation from a friend. - Nothing bad to report really. Pretty pleased.